Thomas is an award-winning chef known for his barbecue and chili. In 1998, he was named 3rd best chef in Florida. Here is the recipe for the best chili you will ever eat. Yes, I know all of the arguments about whether chili have beans or not. But you know what I say: What does it matter? 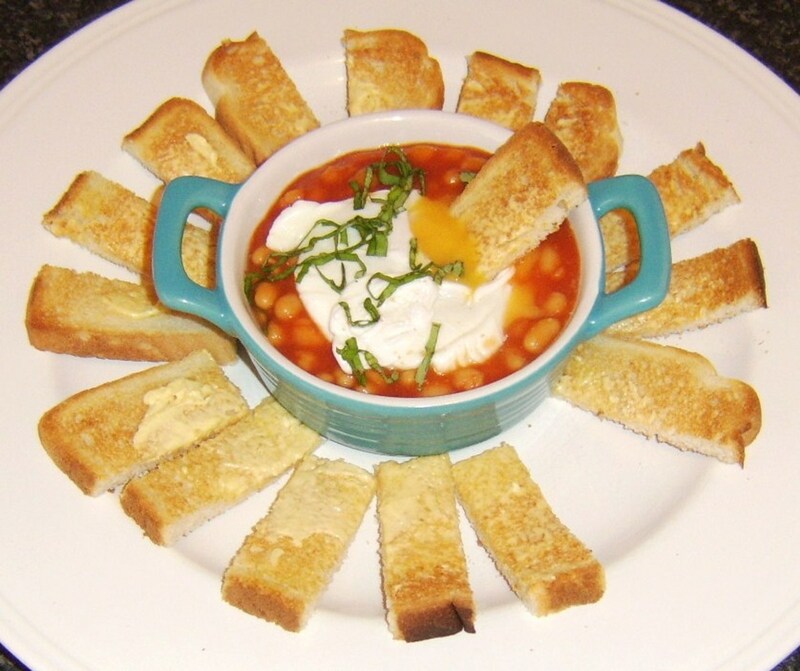 This recipe, which I've won $500.00 for, does have beans, and I myself think that chili should have beans. Chili without beans should go on hot dogs. Though people in some parts of Texas would shoot you for trying to put beans in chili. Chili with beans should be eaten with squares of good homemade cornbread and side dishes of sliced jalapeños, diced-up green onions, and plenty of your favorite cold beer to drink with it. Below is my recipe for the world's number-one chili, hands down. Make it and let me know what you think. Is it or is it not the best? 2 pounds of beef chuck roast cut into 1 inch-cubes. And no, do not trim away the fat. That goes in the pot. 1 pound of ground chuck. Not "ground beef" but ground chuck. 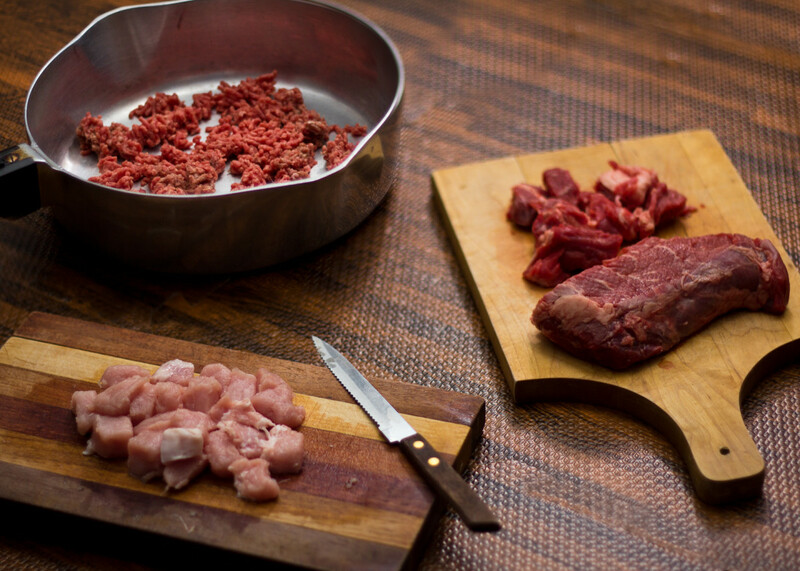 In a large skillet, brown and drain your beef and pork. Add your onions, jalapenos, peppers, and chiles. Cook until your onions and peppers are done and tender. Transfer the mixture from the skillet to a large stock pot and add in all your other ingredients but your beans and tomato paste. Cook over low to medium heat, keeping the chili just below a boil for 6-8 hours. In the last hour, you want to add in your beans and your tomato paste. Serve your chili with squares of Mexican cornbread. 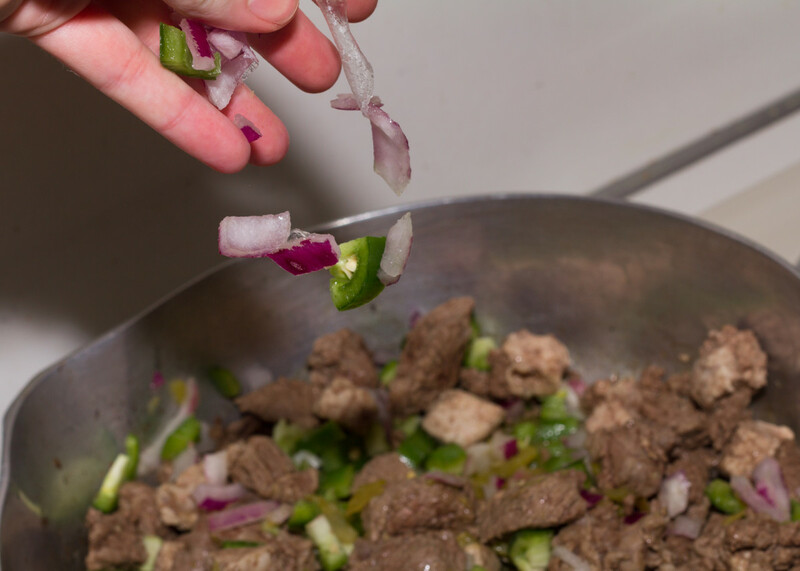 Have bowls of chopped green onions (including the tops), jalapeños, sour cream, and Mexican cheese on the side, so people can add what they want to their bowls. Enjoy. 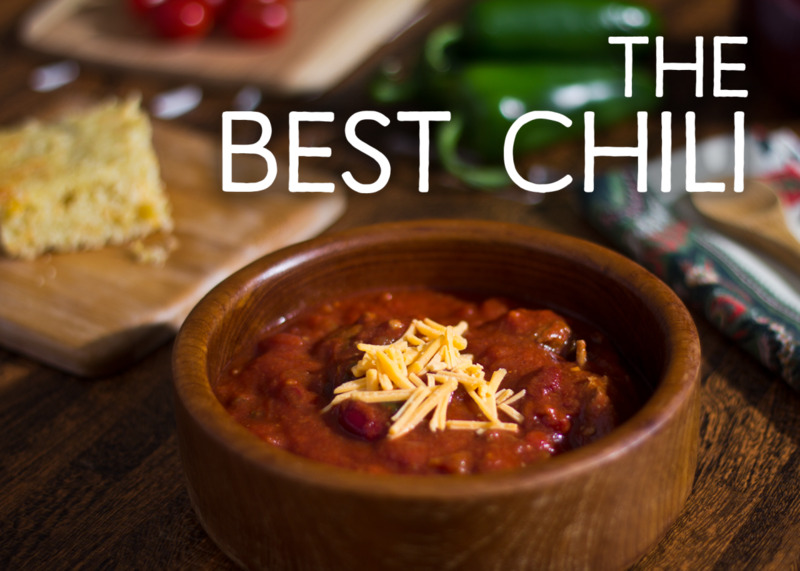 There is no better chili than this, especially if you take the time to make it right. Don't take shortcuts and don't add in anything else. If you want a chili with less fire, then leave out half of the cayenne pepper or remove the seeds and membranes from the jalapenos. I don't think the original recipe has too much fire, but some people like even less fire, and that's how to do it. 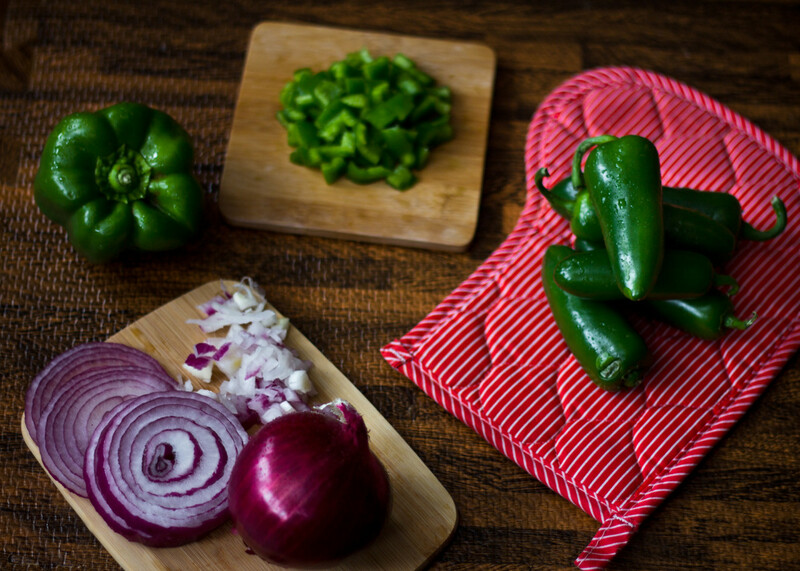 You will want to add all of your ingredients and cook your chili down for the best results. It really does need to cook just below a boil for 6-8 hours to produce the best chili. 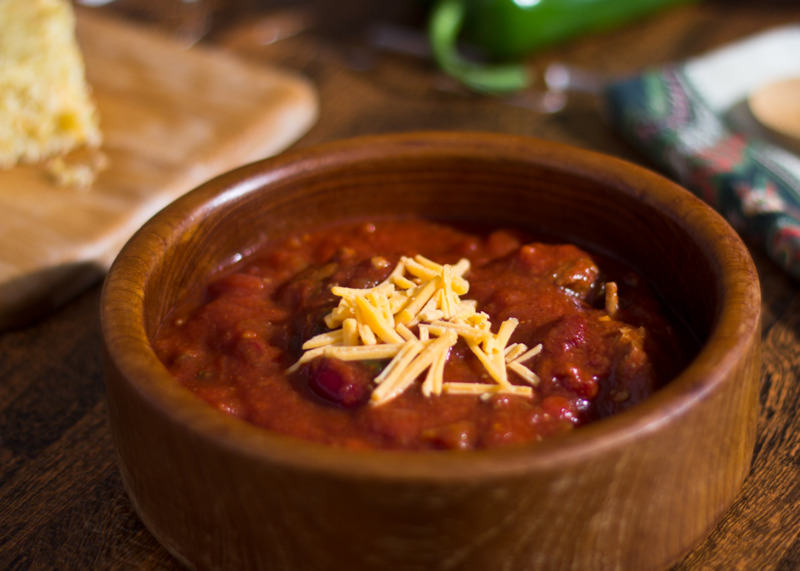 You can't cook this chili in a Crock-Pot or slow cooker and hope to get perfect chili. While you're cooking your chili, if you think it is getting too thick, taste it. If you like what you have, then remove it from the heat. If you actually think it's too thick, add beef broth a cup or so at a time. And, of course, if it's not yet thick enough, keep cooking. And you have now made the best-tasting chili that you will ever eat. In fact, this is the recipe I have won multiple first-place cash prizes for, including the $1,000 prize in the Green Cove Springs Chili Cook-Off. 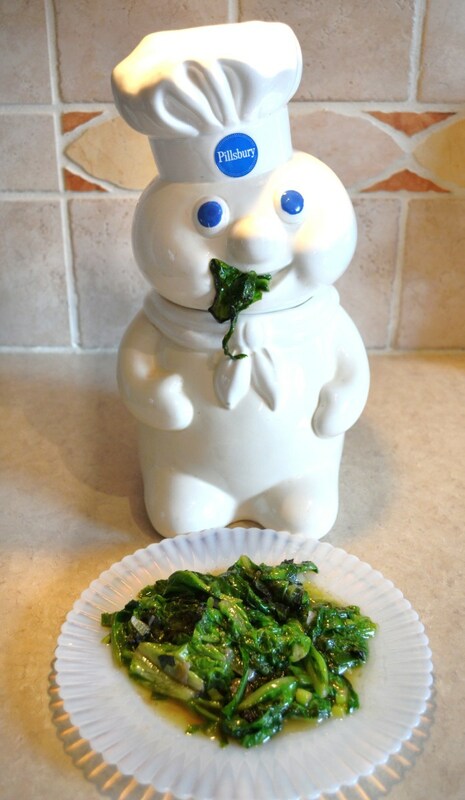 Many other people have won cook-offs with this recipe as well. When you make it, please let me know what you think by posting a comment below. Hope you have fun eating it. Also, if you wish, tell us your tips, hints, or questions below. 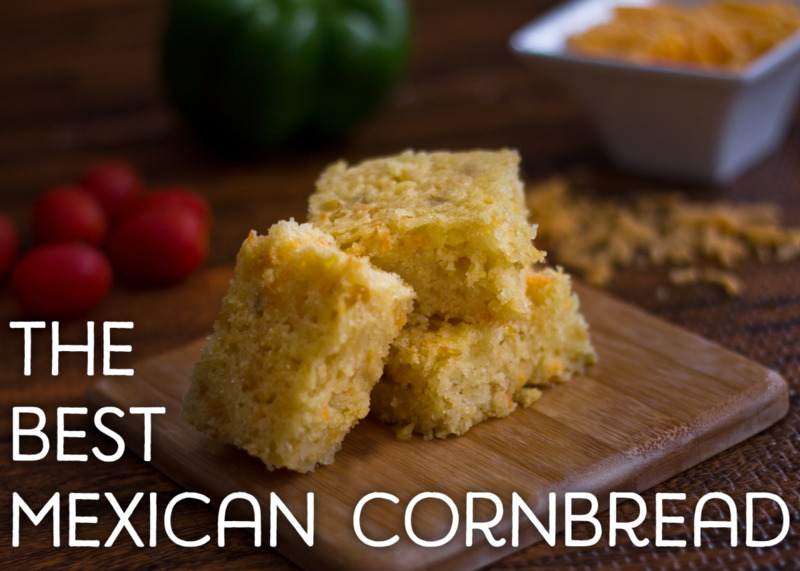 And I guarantee you that this is the best Mexican cornbread you will ever eat. Preheat your oven to 300°F and spray a 9x13-inch baking pan with a non-stick cooking oil. 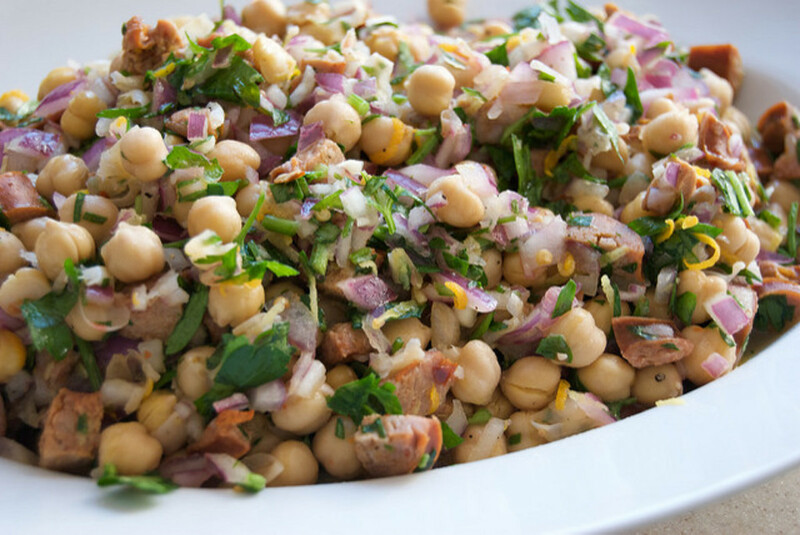 In a large bowl, mix together all of your ingredients together very well. Pour your mixed ingredients into the baking dish and bake for 1 hour or until a toothpick pushed into the center comes out clean. This Mexican cornbread will be absolutely wonderful with the chili above. You will not find a better combination anywhere. I’ve made this dozens of times and it IS the best. Very spicy with 3 tablespoons of cayenne so keep that in mind. I recommend 1. After years of making it, however, I did make a change which I believe is an improvement. Because the recipe calls for a lot of tomato, I substituted one of the 28oz cans (I use 2 28 oz cans usually) of of tomatoes for a 2 cup slurry of water, Better than Bouillon (that’s the brand) beef bouillon, 1 tablespoon soy sauce, and a few dashes of Worcestershire. It yielded a more savory and,obviously, a less tomatoey chili. Absolutely killer! Do you have to use a Budweiser or can you use another beer. I can’t wait to make your chili! I just won a Chili Cook Off at work. This is THE BEST Chili I have ever tasted. So smooth. As recommended, I left out some of the heat by removing some of the seeds from the jalepenos. Thank you for sharing : ). I first made this chili in 2012. It is the best in the world. Snow day today - so I spent the day making this chili. Didn't have the green chilis, and the store did not have ground chuck (used ground sirloin). Cut the # of jalapenos in half. Otherwise, followed the recipe as written. And this is DAMNED good chili. HOT, really hot (going to take some to my trainer tomorrow. He loves hot spicy food and will love it). Also, learned something new, really important when making chili. Chili IS better if it's made on the stove all day long rather than a crock pot. Will make this again. Thanks! 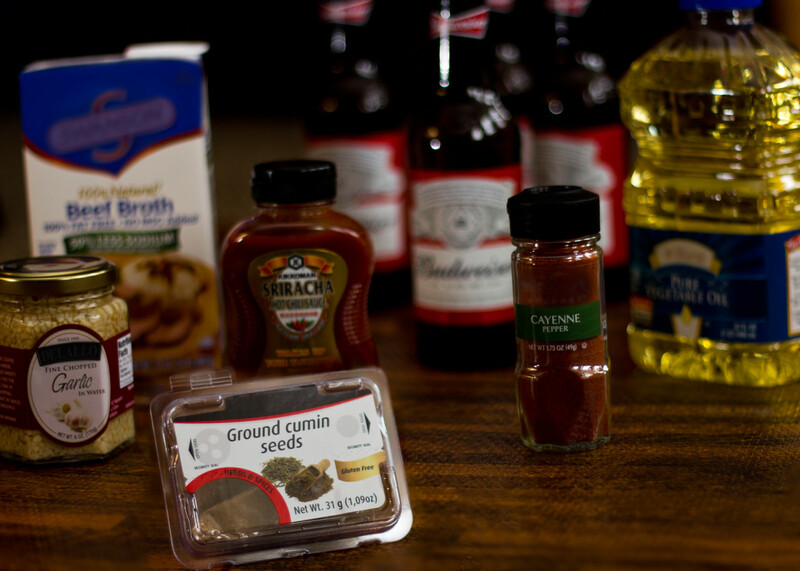 If you don’t want to use alcohol in the chili is there a substitute you can use? Add more beef broth? I made this chili for my husband, who doesn't like chili, and he loved it! Made the cornbread as well. I usually don't care for cornbread but this was amazing! So moist and flavorful!! Thank you for sharing your recipes! 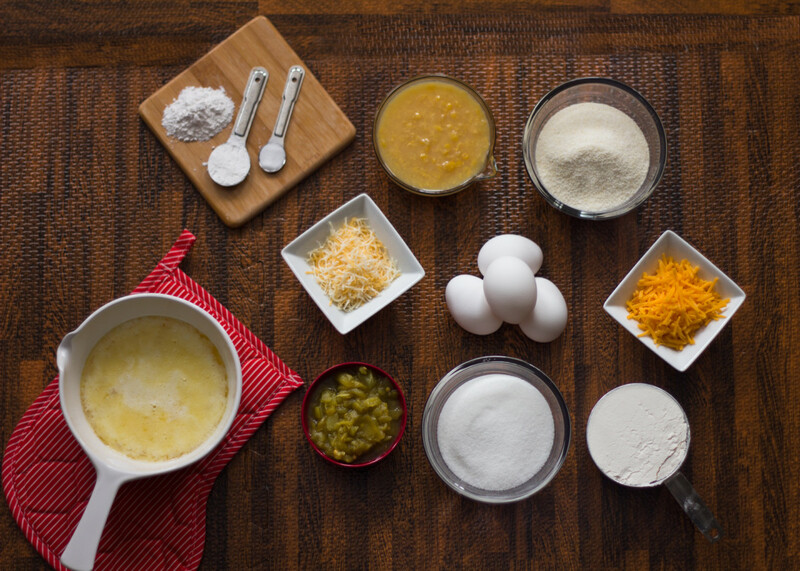 How many servings does your recipe yield? How big is the large can of tomato paste? The large can that I saw at the store was still only 12oz. I have the chili on the stove, looks like it’s going to be good! I added diced bacon, and did one jalapeño but added Anaheim, Serano, and Pablono peppers. Also cutting the beans down a bit. How large is large for the tomato paste? How much doe his recipe yield? I have to make 12 quarts. Can’t wait to make this tonight what’s the cooking time you recommend if I use pressure cooker ? Do you recommend cooking it covered or uncovered? Making it now for my chili Cookoff tomorrow at work!!! I made this recipe exactly as instructed and won our school's PTO chili-cook off. Then I did again for my son's soccer team party. Everyone asked for the recipe. I have had friends who are chefs and 5-star restaurant owners say its the best they have ever had. My only change was I used Duvel, the beer from Antwerp. Just got 2nd place on a competition for chili, first place on cornbread for the second time entering the contest. So delicious! I learned I shouldn't use a crockpot to make chili. Thank goodness for pressure cookers and extra time to simmer. Saved the day. Thank you so much for the great recipe! Can I cook the chili a day before my event and then just reheat it and have it taste good? 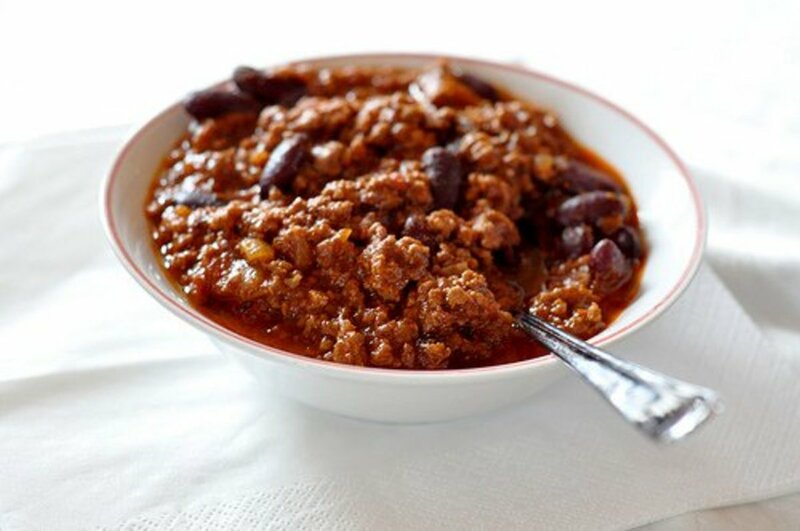 I cooked this all day yesterday for an extended family dinner and everyone LOVED it - it is truly THE BEST chili recipe! Because some are sensitive to heat I used only the flesh of the jalapeños, left out the cayenne, and passed Cholula hot sauce at the table. After cooking down, it had a nice but not biting heat (the jalapeños were large). As a bonus I'm freezing several servings for hubby and I to enjoy later. Simply the best Chili ever!! Great for deer camp and tailgates! Makes a killer Chili Dog too. I have revised your recipe slightly....I have added 2 extra cans of budweiser...4 for the pot and 2 for the cook. It is without a doubt the best in the world. I have a problem on the Chili Sauce since I am in Asia what do I use hot,mild or sweet. I don't even need to make this to know it's darn good. For the one reason I tell everyone who asks me about my chili; you have to use Budweiser. No substitutes allowed. I like that you use beef and pork but I'd skip the white kidney beans and replace with canned pinto beans. Crazyhorse I just want to let you know I made your chili tonight with the Mexican Corn Bread . The corn bread I baked in my cast iron frying pans and all I can say is wow ! The combinations of the hot and spicey chili with the sweetness of your cornbread is phenomenal! This is my goto for life ! Do you think it will make a big difference if I use chili beans vs kidney beans? Hello, I have made this recipe twice. The first time my family liked the flavor but could not eat it because it was way too spicy for them (wife, in-laws, and 3 young sons). The second time I experimented with the peppers and amount of cayenne to tone it down, but it was still too spicy for them. We all agreed the flavor was terrific, so I'd like to modify it for the family. Do you have any ideas? How many will this recipe feed? SO Im goofed and didnt see that i need the lid off of partly on, its been cooking slowly for hours and runy! Is there something i can do to thicken it? i have one second place three years in a row with this recipe. we only have 3 hours to cook though so i cut back on the liquids. What can do differently to get the coveted 1st Place Blue Ribbon? http://bit.ly/1Hg6Hni If you want a less spicy chili try the recipe that I have there for everyone. It is called Double Cheese Chili and it is a wonderful chili recipe that you should try. I used your recipe for a friendly chili cook off and we found it to be too hot, even after I cut out 1 jalapeño, all of the seeds and used less cayenne pepper. I guess we can't handle our chili like they do in Texas! Other than that I thought it was delicious. If I made this again, I would use half the hot peppers and cayenne, and add more meat. 4 lbs seemed like a lot, but when I dug in, I felt it needed more! Your very welcome. Thanks for the report and comment. It is appreciated. I have just won second place at a chili cookoff with this recipe ( I lost due to bacon bits and better marketing ;) Thank you crazyhorseghost! Bud Light will work fine. I have made this chili several times and it is the best I've ever tasted. One question though....we now live in a dry county and have to drive 50 miles one way for beer. My husband has beer he bought for bread, but it is Bud Light. Can I use this instead of regular beer. I also have two bottles of Guinness beer so could I use half and half. If this is not recommended, we'll just have to drive to Tupelo, MS for regular beer. 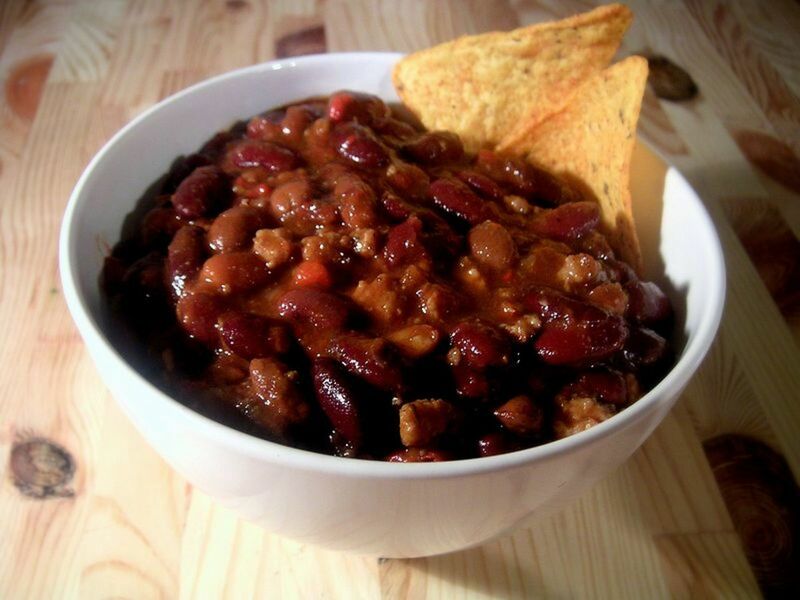 Thank you so much for sharing this fantastic best ever chili recipe. Yes you can freeze it and it is wonderful when thawed. Can you freeze this and it be just as good when reheated? I am very interested in using this chili recipe in an upcoming chili cook off however we are only given 4 hours to have it completed... how important is it to have it simmering for 6-8 hours? I used this recipe last year and all my family loved it cooking it again today it is the best chili ever . The beer once cooked will have no effect at all. Look in the Asian Section of the Supermarket for Chili Sauce. Or ask at the service desk of the supermarket. They most likely have it. Heinz sells it in most supermarkets and grocery stores in a 12 oz bottle. Hello! I can't wait to make this chili tomorrow for some friends and a night of football! However, 2 of my friends are pregnant and I'm concerned whether the beer will have some sort of effector it will be ok for them to eat the chili. I want to use the beer just becauseni think it will bring great flavor but am not sure. Also, I couldn't find chili sauce, what can I use as a substitute? Have the chili cooking on the stove. We are iced in and I was out of cayenne pepper so I had to use crushed red pepper and only had ground sirloin and chili meat. Keeping my fingers crossed that it tastes as good as it smells! When we thaw out I plan a trip to the store to buy the correct ingredients and cook up another pot of chili!! 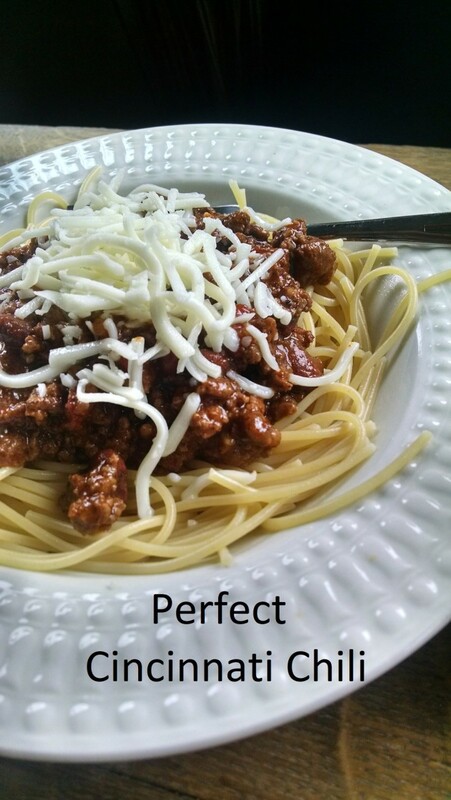 Thank you for posting your recipe! I added some Venison from my last deer hunt, but to kept the original recipe....OUTSTANDING! Thanks very much for your comment. It is truly the best chili I have ever made. I have won many prizes with this chili. It is so delicious. I made this for a company chili cook off and won 1st place! I made my chili late in the evening and let it cook overnight...the whole house smelled great. We prefer a less spicy chili so I cut the jalapeños to 3 and cut the cayenne in half. I did not have quite enough ground chuck so I added 1lb of homemade sausage. It worked out great. This is not an inexpensive dish, but it is absolutely worth it. Quality ingredients result in an incredible chili. Only chili I will make. Yes butter will work fine. Can I substitute butter for the margarine in the cornbread recipe? This recipe seems amazingly good. I'm cooking it right now for a chili cook-off tomorrow. I had to substitute a couple of things which I really didn't want to but I'm already into this chili for $40.00...I am glad to have found this recipe and hoping it is a hit a the chili cook-off. It smells delicious right now. So it is 2:00 a.m. and I have found the just below boiling point. Going to sleep on the couch and stir it throughtout the night. Thanks for the report. It is wonderful. Did you see the one above. Its wonderful. This is by far the best chili I have ever had and I love my chili!!!! Thank you so much for the recipe. I made it for a work contest last year and won 1st place! I am making it again for a group of people this weekend. I am going to try it with Guinness to see how the taste is. Hopefully it's spetacular. Thanks again! I'm making the chili now. It's been cooking for 3 hours & smells delicious. I followed the recipe exactly, although I was tempted to substitute tri tip for chuck roast. Can't wait to eat this with cornbread tomorrow. I made this for my in-laws this weekend and they raved about it. My FiL is a very picky eater and he praised the loudest. Thanks so much for posting this recipe. I won 6th place out of 32 chilis!!! The ones that beat me had a sweet, spiced flavor. I'm not a fan. Great recipe thanks !!! Chili tastes great! I'm wondering if I cook more meat and add it will it be a different taste since it didn't cook with the sauces and beer for as long as the other meat? Taste it and see if you have what you want. Let me hear how it turns out. Thanks. I've been cooking my chili for 4 hours, and it has reduced by almost half. Is this normal? Should I still cook it 2-3 more hours? Use half the amount of apple juice if you don't like the taste of beer. There is a little taste of beer left for some people. The lid over the top of the pot about 2/3 covered while the chili is cooking. You can keep it slightly covered while cooking. This chili needs to cook down. Its for that reason I would not cook it in a crock pot. You'll never get it to cook down in a crock pot or slow cooker. You can keep it warm in a crock pot or slow cooker after cooking it. 1) Should I keep the stockpot covered the entire time while cooking? 2) Is there any way to adapt this for a slow cooker? through the day to keep it warn? It is truly one of the best chili recipes ever. I love this recipe! I have it on the stove now! Thanks for sharing! Hi there! First off, I've already snuck a little taste and YUM!!! I'm practicing now for a chili cook off for Super Bowl this coming Sunday! I don't eat pork, so I left out the chops. I followed most everything else on the recipe, used less jalapeño and less broth due to not using the pork. I've got about 2 more hours of stove top cast iron cooking to go. I'm worried that it's too liquidy. I have yet to add the final ingredients, beans and paste. Should I be worried at this point that I've messed something up?? Like I said, it tastes AMAZING, but I was hoping for a thicker consistency! Please let me know asap!! Love the recipe! One more question I want to do a trail run can I cut recipe in half? Either way will work fine. Let me know how it turns out for you. Thanks. Can u use dry beand if u soak overnight? Or is canned better? It was the best chile I ever had! do u drain or rinse ure beans? You could use ground pork or well browned and drained pork breakfast sausage. What can I use to substitute the boneless pork chops? Wow! This is the best chile ever! I will be entering it into our local fest in a couple weeks. Thanks for the great recipe! Your very welcome. This has always been one of my favorite chili recipes. I appreciate your comment. Great chili I also won a chili cook off at my local bar in town thanks for the great recipe!!!! I would start with 6 ounces and if it was not thick enough for you add 6 more. Made the mexican cornbread the other week - RAVE reviews - and I mean RAVE!!! Looking forward to making the chili... I've read ALL of the comments and saw two different answers to the tomato paste - 6 and 12 ounces. How much do you use for a single batch? I doubt you'll get this in time, but how would you feel about adding a little bit of unsweetened cocoa to this recipe? I've done that with several of mine before and I think I am going to make this with about 1 tbls of cocoa and maybe some shavings of mexican semi sweet chocolate (they have cinimmon and sugar in it). I just got this all assembled and I'm cooking it!! It smells delicious, wasn't too pricey to make. I saw this on pinterest and 516 people liked it,so I figured it must be good. Thanks for posting this recipe, ill update on how it turns out tonight! 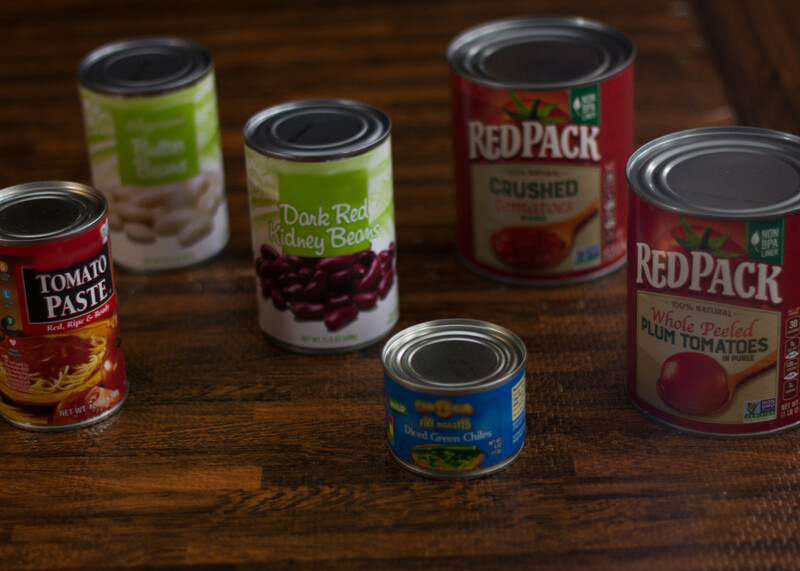 Do you drain and rinse the beans or put them in straight from the can? Hello! 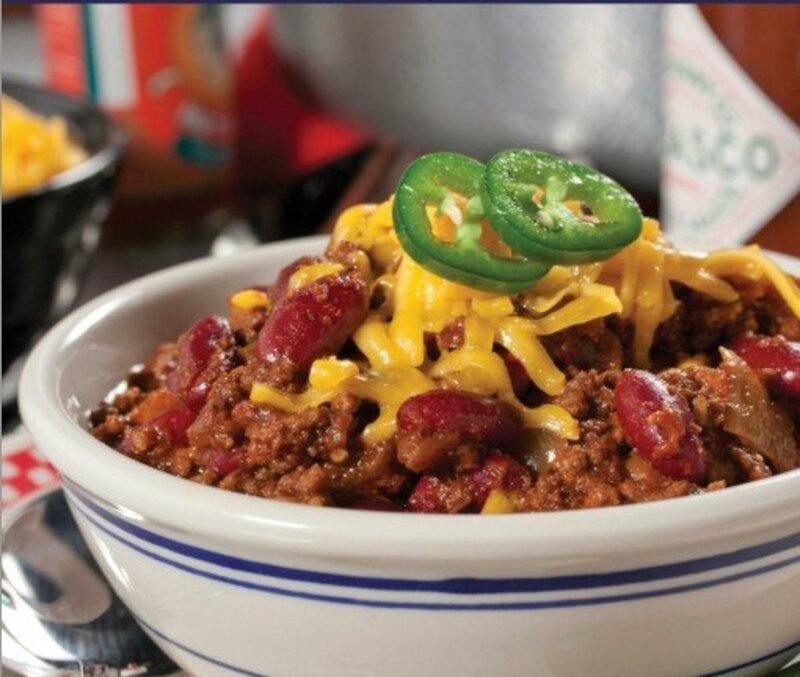 This is our favorite chili and truly the BEST chili I have ever eaten! I really appreciate that you are so considerate in sharing your recipe with the world. Thank You! P.S. the cornbread is awesome...we are having the chili and cornbread for dinner shortly. Yes it works very well with apple cider. I did go ahead and use apple cider, thank you!! It was delicious! No it does not have a beer taste. But use apple cider to be sure you can't taste it. regarding the beer, my issue is I don't like the taste of it... so, does the chili have a beer taste to it? Yes its perfectly fine to do it that way. It will only improve the flavor. do you think it's ok to make this a day ahead and warm up before the cookoff? i was thinking it might give more time for the flavors to meld together?